The purchase requisition and invoice workflows used in the previous post assigned the approval tasks to the cost center manager of the person that requested the goods or services irrespective of the singing limit of that manager. 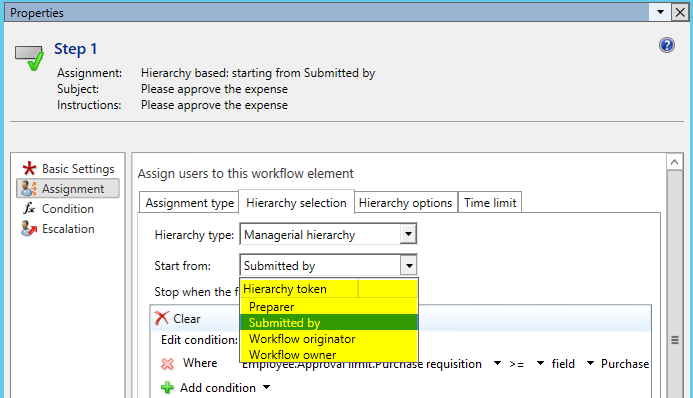 To incorporate the signing limits into the purchase requisition workflow approval step, I tried to modify this step in a way that it refers to a hierarchy. Unfortunately, this hierarchy selection did not allow me starting the workflow from the requester, as illustrated in the next screen print. Applied to the example that was used in the previous post, the available ‘start from’ selection options do not allow assigning the approval task to Susan’s cost center manager unless Susan would submit the purchase requisition herself. 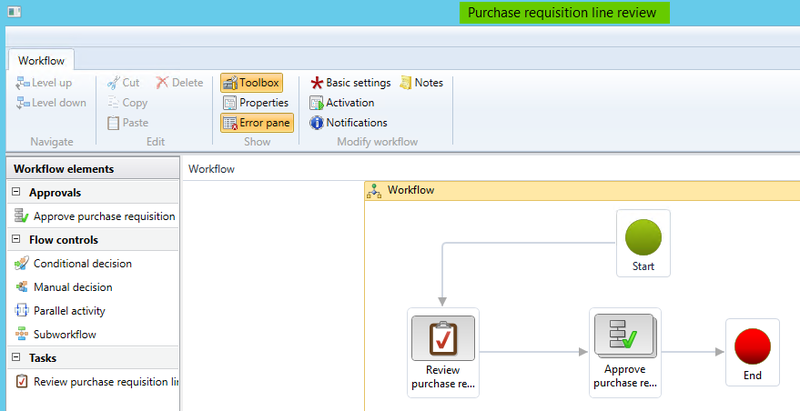 To get this issue resolved, the purchase requisition workflow has been setup as a purchase requisition line review workflow, because this line-workflow type allows to be started from the requester. For details, please see the next screen prints. 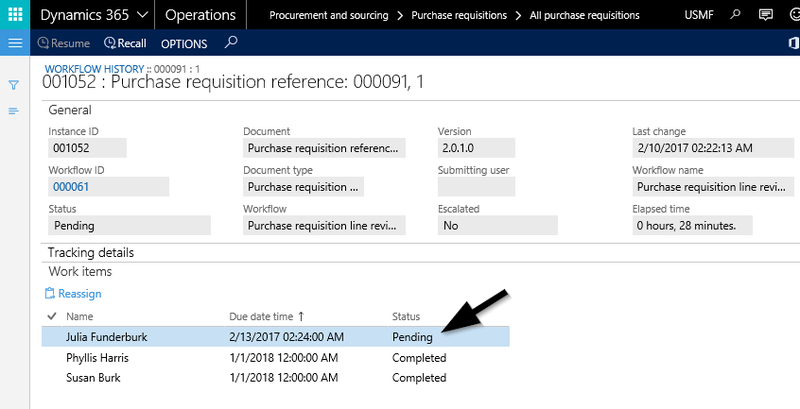 In prior versions, the standard purchase requisition workflow could be started from the requester. This option has, however, been removed and as a result, a purchase requisition line-item workflow needs to be used to achieve the same. 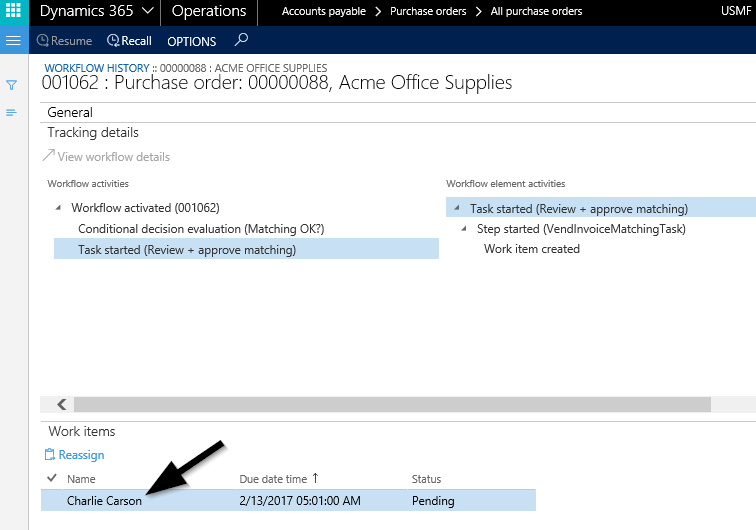 To get the line-item workflow running, it must be incorporated into the ordinary purchase requisition workflow. This is achieved through the following setup. In the following, a purchase requisition for a training course with a total value of $10000 is submitted to the workflow. Because of the changes that have been implemented, the approval task is now assigned to the marketing executive Julia because she has a sufficiently large signing limit. For details, please have a look at the following screen prints. In line with the changes that have been made to the purchase requisition approval step, also the invoice review & approval matching step has been modified in a way that it starts from the workflow owner. Similar to what has been shown in the previous posts; Phyllis the accountant has been setup as the workflow owner and has been incorporated into the position hierarchy. For that reason, the correct person that is required for approving the invoice deviations can be identified. If we continue the example and record a vendor invoice for $10900, that is an invoice with a price deviation of >5%, the review & approval task is directly assigned to Charlie, the president, as he has a sufficiently large signing limit. This post ends the series on expense related vendor invoices. Based on what has been shown in the previous posts, it can be summarized that Dynamics AX/365 for Operations ships with a powerful and flexible workflow engine that can handle various invoice review and approval scenarios. 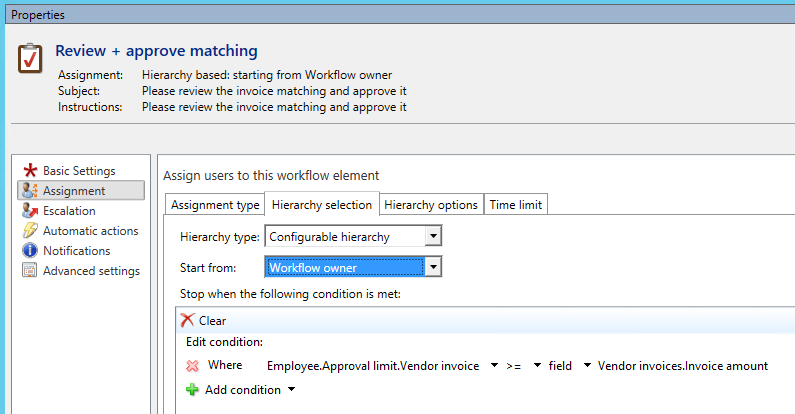 Setting up the different workflow steps might not always be as easy and straightforward as one can find this in specialized workflow add-on’s to Dynamics AX/365 for Operations. In addition, the previous posts showed that the pending vendor invoice form needs some modifications in order to allow users identifying the current workflow step and responsible at a glance. Against the background of those ‘disadvantages’, the reader should be able to assess whether those enhancements can be built into Dynamics AX/365 for Operations oneself for the same or a cheaper price than a specialized invoice workflow add-on.